Designed to cut aluminium, copper and telecommunication cables having a maximum overall diameter of 120mm. Our esteemed clients can avail from us an exclusive range of Hydraulic Crimping Tool for Telecommunication Industry. Our complete range of Hydraulic Crimping Tool is made of high quality material & is also quality ensured. 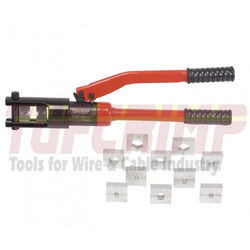 Our clients can avail these Hydraulic Crimping Tool at very affordable prices. In order to meet excellent quality standards, we are supplying Hydraulic Crimping Tools(dowells, jainson, etc). Hydraulic applications tools such as nut splitters for removal of frozen or corroded nuts, flange spreaders for separating pipe flanges without the need of hammer and chisel, tire bead breaker for earthmover & cable crimping tools are also available.